(Boston, MA) The Niceties is a play about primary sources. It’s about the writers of white history, and white history’s casualties. It’s about speaking effectively and effective listening. It’s about race and the people who decide what is and isn’t racist behavior. It’s about attempting to be a good person while being good to other people. It’s about an impetuous Black student who’s had enough of excuses from a white professor, and an egotistical white professor who’s forgotten how to teach. There are no winner; there’s only complication. Zoe (Jordan Boatman) is a junior at Yale. Janine (Lisa Banes) is her professor. To paraphrase wildly, Zoe has submitted a radical thesis paper for comments to Janine on the effects of Black slavery on the Revolutionary War that Janine doesn’t agree with. Moreover, Zoe has included a dubious tertiary internet source as evidence of her thesis’ accuracy. Janine responds with micro-aggressions, patronising anecdotes, and elitist hyperbole. Zoe counterattacks with accusations of bigotry, unrealistic expectations of institutional growth, and disrespect. Neither listens; neither seeks to understand. Everything comes to a head when Zoe reveals that she has recorded their heated diatribe. It is released to the public. Elihu Yale was a slave trader. Yale University was built on the backs of slavery (so was Harvard). There was an incident at Yale in 2015 that inspired this play. A white-feminist professor wrote a private email about costumes. It was made public. Students protested her imperceptive attempts at making nice. The now ex-professor wrote an obtuse response for the Washington Post in 2016. It would benefit a potential audience member to read up on the source material before seeing The Niceties. It helps determine fact from fiction during viewing, and in discussion after. Racism is the foundational core at all of our current social and civic inequities. It affects all other issues including sexism, ablism, elitism, bigotry, fiscal disparity, etc. by determining whose voice is heard first, how it is heard and when. American histories that don’t include excerpts on racism’s impact on all major and minor events (from who owned slaves to which Supreme Court Justices supported affirmative action) should be catalogued as inaccurate and obsolete. Further, theatres and theaters that don’t follow the cultural narratives are destined to be at the mercy of antiquity. There is a mighty race within Boston to produce the most woke, the most culturally aware playwrights and plays. This would be commendable if more theatres were hiring locally. The Niceties hired many crew members who are not from the New England-area. They created a beautiful show, but they had to visit here in order to do it. Elisheba’s powerful, insightful sound design and original composition beautifully trolled the majority white audience. Her selections were subtle and generation baby boomer sensitive. Many of her impressive credits come from the New York area. Jordan Boatman is an excellent actor. Her performance as Zoe is riveting, and everyone who can should see her perform. There are excellent female, Black actors who live and work in New England. Hire them. Lisa Banes is also excellent. It’s no surprise that the Huntington asked her back after work in Present Laughter. There are so many female, white actors living in the Boston-area that one can’t leave the house without bumping into four of them. Hire them. The Niceties teaches us that it isn’t enough to think that the work one is doing enough. It’s important to know that one is doing as much as they can, and then do more. Doing what we think is right and assuming that it’s enough because it’s so hard isn’t enough. No theatre is really working towards equity if they aren’t focused on their local community in addition to national and international community. My brilliant wife and I got into several intense fighting matches about this show. My wife believes that the professor was right to dismiss Zoe’s inclusion of a blog post, no matter how insightful, in Zoe’s thesis. I responded that everything is on the internet these days. The Duke professor’s work that Janine suggests should also be on the internet. I continued that her argument about sourcing is one way the professor discredits Zoe’s personal experiences as a person within history. Yes, Zoe is wrong to include a blogger as a source (cough), but Janine has no right to patronize a student who wants to learn. There are sacrifices one must make while a student to complete their education; personal dignity should not be one of them. We both agree that academia should be difficult, not traumatizing. That is where many of our agreements stop. The Niceties is that kind of show. It will draw stark lines between rational, loving, devoted people who agree on many points except the ones that matter to them. I’m extremely lucky to be married to a person with whom I can disagree and still respect for keeping me on my toes. See this play with that kind of person. Seeing it with some who will agree with you will only give you a self-satisfied feeling of being “right.” This argument is too complicated, too steeped in historical inequities to be so simple as right or not right. 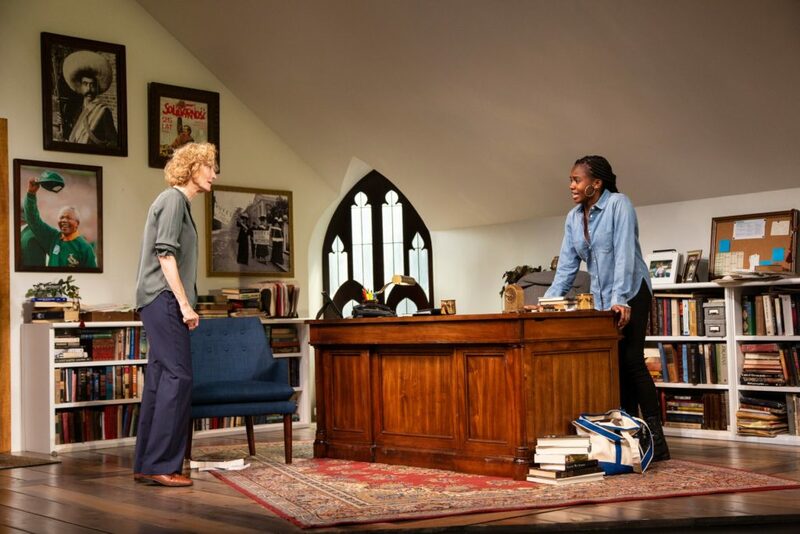 This entry was posted in Drama and tagged 2018, August, boston center for the arts, Calderwood Pavilion, Eleanor Burgess, Elisheba Ittoop, Huntington Theatre Company, Jordan Boatman, Kimberly Senior, Lisa Banes, September, T. Charles Erickson by Kitty Drexel. Bookmark the permalink.